During the late 1960’s and 1970’s, Corridor L was completed as a four-lane expressway between Interstates 64 and 77 in Beckley to US 60 in Summersville, and as a two-lane expressway north to Interstate 79. The highway, signed as US 19, allowed north-south traffic to move through the central highlands of the state without having to go through Charleston and along the two-lane West Virginia Turnpike. The first section, in Oak Hill, was completed in 1965. 5 The section south to US 19 in Raleigh County was opened in 1973 and another segment from Lansing-Edmond Road in Lansing north to US 60 opened in 1974. Further sections north to Interstate 79 were two-lanes and was completed in phases from 1973 to 1978 (a second carriageway was added in 1995 to 1996). At the center of Corridor L was the New River gorge containing depths of up to 1,000 feet. Construction began in 1974. 3 A four tower cable-guiding system was used to help position steel into their respective positions. 1 Originally designed to be a painted arch span, US Steel utilized its then-new Cor-ten weathering steel. 3 Cor-ten steel was a group of steel alloys that obviated the need for paint and would weather into a rust-like appearance after being exposed to the elements for several years. 2 The result was an immediate cost saving of $300,000 1 and additional savings of $1 million per each time the painted span would need refurbishment. 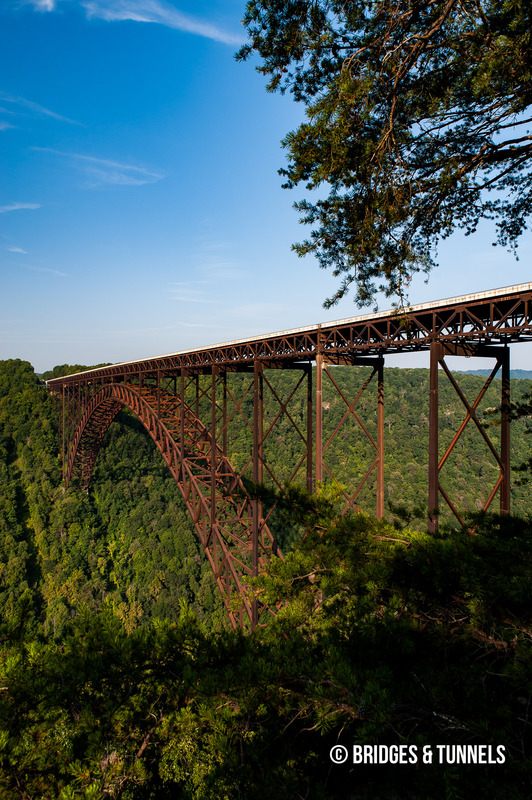 The rust-like appearance also blended better with the natural terrain of the New River gorge. 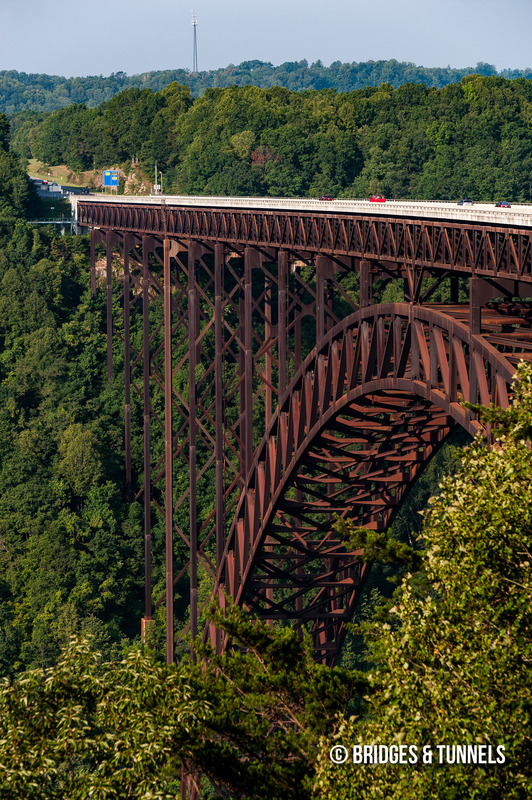 On October 22, 1977, 1 3 6 the New River Gorge Bridge, carrying US 19/Corridor L, opened to traffic. Previously, US 19 crossed over New River at Prince, today’s WV 41. The only other crossings in the vicinity were WV 16 (formerly US 21), and the narrow and dangerous WV County Route 82 via the Fayette Station Bridge. The latter took nearly 45 minutes as the roadway was confined to a single lane in some sections. The new span, in comparison, shortened the crossing to just under one minute. 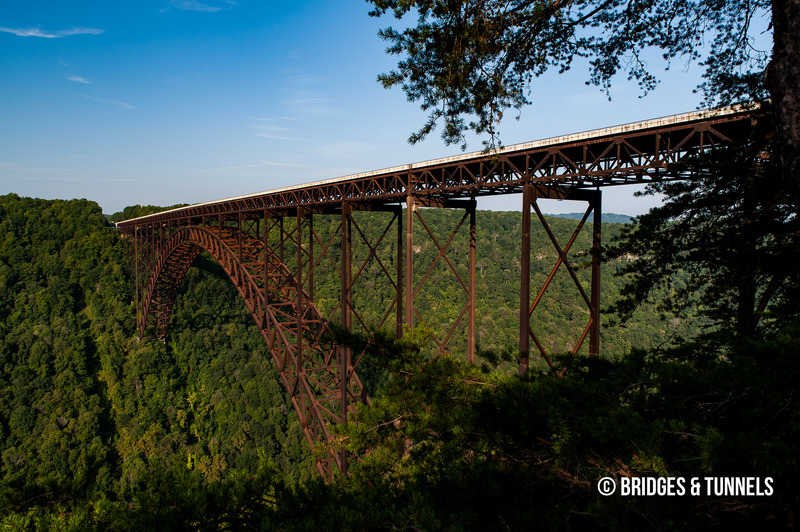 On November 8, 1980, the first Bridge Day was held when two parachutists jumped from a plane onto the New River Gorge Bridge deck. 1 Five parachutists then jumped from the bridge itself down into the Gorge. In 1984, 300 BASE jumpers participated in Bridge Day, with thousands walking across the 3,000-foot span. The event continued to grow, being interrupted for one year after the September 11, 2001 incidents, and now includes the Bridge Day High Line and Down Under Tour. Cruikshank, Morgan Ryan. “The New River Gorge Bridge.” March 15, 2007 Article. “Weathering Steel.” Mittal Steel. March 15, 2007 Article. Koors, Rich. “NEW RIVER GORGE BRIDGE.” March 15, 2007 Article. Prince, Adam. “It’s That Bridge They Bungee Jump Off…” Gribblenation, January 22, 2002. March 15, 2007 Article. Release Date Report. West Virginia Department of Transportation. August 2003. New River Gorge Bridge. Washington, D.C.: Historic American Engineering Record, n.d. Web. 26 Oct. 2012. Article.